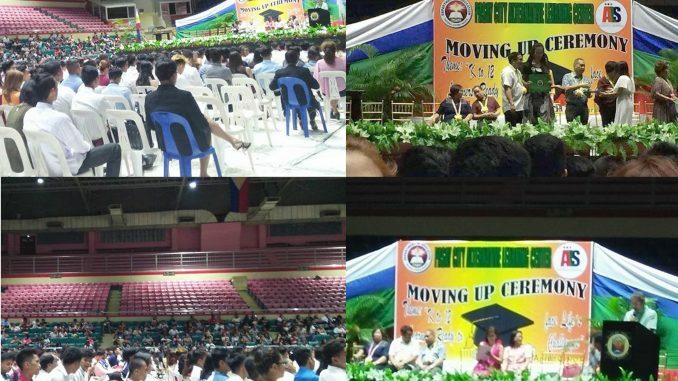 Alternative Learning System (ALS) in Pasay City closed this school year 2017-2018 through the 17th Moving-Up Exercises with forty four (44) number of learners graduated in the Elementary and six hundred ninety nine (699) Junior High School completers under this year’s graduation theme: “K-12 Learners: Ready to Face Life’s Challenges,” on April 19, 2018 at Cuneta Astradome, Pasay City. Alternative Learning System (ALS) caters mostly drop-outs from elementary and secondary schools, out of school youths and even working individual who are willing to learn and receive the certificate of completion. The Moving-up ceremonies commenced with the entrance of the DepEd officials headed by Dr. Evangeline P. Ladines, Schools Division Superintendent, Dr. Melody P. Cruz, OIC-Assistant Schools Division Superintendent, Mr. Librado F. Torres, Chief, Education Program Supervisor for Curriculum Implementation Division, Mrs. Irene S. Tonel, Chief, Education Program Supervisor for the School Governance Operations Division, Mrs. Edna P. Madrid, Education Program Supervisor in-charge of ALS and guests, followed with the procession of the graduates and completers together with their parents and mobile teachers, then the entrance of colors headed by Scouts of Pasay City West High School. Also present in the celebration were the Pasay City Government officials. Pasay City Mayor Antonino G. Calixto reiterated in his message that “Each ALS learner shall receive an allowance PHp500.00 monthly coming from the city government starting this June 2018. “Always leave the positive mark and be the best person you can be”, statement delivered to the graduates and completers of ALS by Congresswoman Imelda “Emi” Calixto Rubiano. Leading the Elementary level and topnotcher for Accreditation and Equivalency (A&E) Test is an 18 year old lady, Johaira M. Macaundas. “Hindi hadlang ang mga nangyayaring unos sa aming buhay ngayon subalit ito ang nagiging dahilan upang ako’y magpatuloy sa aking pag-aaral” she said. On the other hand, John Edsel R. Javier, was a topnotcher during the Accreditation and Equivalency (A&E) Test in the Junior High School. Im Micke Angela V. Martinez, 22 years old from Pasay City. I would like to ask if you are hiring for the ALS Teacher? Please call our CID office @ 8338118 and look for Mrs. Edna Madrid, EPS in ALS. Thank you.